MAB Corporation recently welcomed Quest NewQuay to Caravel Lane. Designed by DKO Architecture, the new property comprising 221 serviced apartments is the network’s largest property to date. 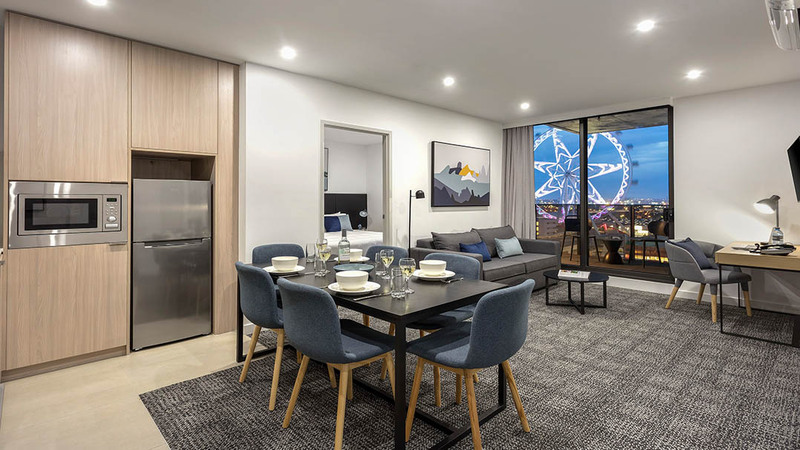 Developed by MAB Corporation, Quest NewQuay is the fourteenth tower completed by MAB in the precinct, bringing the total investment to more than $2.5 billion. The hotel opening comes at a time of significant change for NewQuay with the recent approval of the NewQuay West Masterplan, the redevelopment of The District Docklands Shopping Centre and the completion of NewQuay Central Park. The apartment hotel is situated within walking distance of Marvel Stadium, The District Docklands, Melbourne’s free tram zone and only 300 metres from Dockland’s Skybus stop. Just 20 minutes from Melbourne Airport, Quest NewQuay caters well to business travellers in need of a direct route to and from the city. “The Docklands has grown to become one of Australia’s most vibrant precincts and will continue to attract families, business travellers and tourists for years to come,” said Quest Apartment Hotels Chief Commercial Officer, Craig Ryan.